Nebraska's Steve Goddard (left) and Jon Kerrigan (right) meet with a Japanese colleague during an international trade mission in early February. Lincoln, Neb. 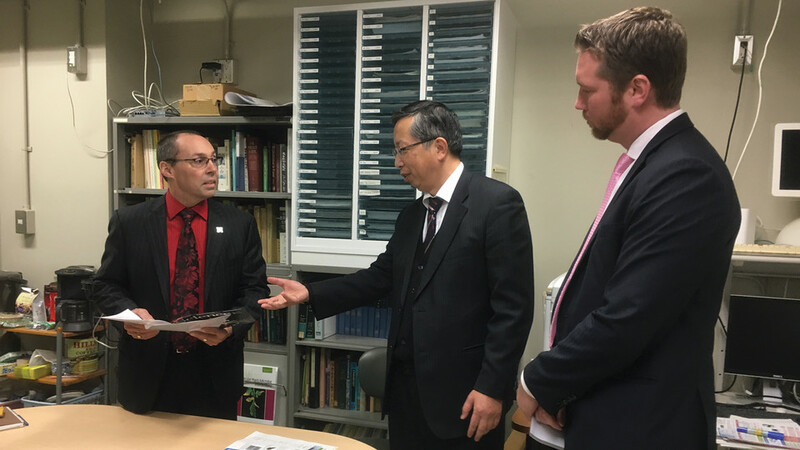 — A collaboration between the University of Nebraska-Lincoln and the Nebraska Department of Economic Development is helping strengthen international trading ties between the Cornhusker State and Japan. In early February, Nebraska delegates embarked on a five-day visit to Tokyo and parts of Japan's Hyōgo prefecture, including the city of Kobe. The delegation met with government officials, industry representatives and academia for the purpose of promoting business and trade relationships. The trip featured a visit with Kazuo Kanazawa, vice governor of Hyōgo prefecture, in addition to meetings with companies, including Kewpie and S Foods, which operate Nebraska's Henningsen Foods and Fremont Beef, respectively. "The relationships we are building are key as we grow as a global university," said Michael Boehm, vice chancellor for the Institute of Agriculture and Natural Resources. "The partnerships evolving between Kewpie, the state of Nebraska and the university are exciting and impactful for all." "From DED's perspective, this trip was successful not only because of the trade and investment opportunities that it promoted between Japan and Nebraska, but because it saw both agencies come together to pursue their mutual goals of growing the Nebraska economy and expanding our international presence," said Dave Rippe, director of the Department of Economic Development. The delegates' visit was punctuated by a dinner at Prime 42 by Nebraska Farms – a Tokyo steakhouse rebranded, following a September trade mission by Gov. Pete Ricketts, to feature Nebraska beef and products. This showed firsthand the impact that trade missions have on growing the state's foreign relations and investment. "It's so powerful to be able to tour the factories, talk with the representatives, ask questions and listen to what they have to say about their experience doing business in and with Nebraska," said Daniel Jackson, Nebraska's international business manager. "Japan is one of the state's most important trading partners, and a big part of that is the work that continues to be done by the governor, as well as agencies like DED and university, to forge and strengthen those relationships."